Prescription drug and opioid abuse is a growing national health emergency that impacts every community in Michigan. From 1999 to 2016, the total number of overdose deaths involving any type of opioid increased more than 17 times in Michigan, from 99 to 1,689, according to the Michigan Department of Health & Human Services. Michigan hospitals are helping fight this deadly epidemic by working with lawmakers, state departments, physicians and the public to raise awareness and improve clinical processes. The MHA served on the Michigan Prescription Drug and Opioid Abuse Task Force, an effort formed by Gov. Rick Snyder, that included a comprehensive report and more than two dozen recommendations for changes in regulations and practices that could help address the growing problem of abuse in Michigan. Also, the MHA Keystone Center has worked with hospitals to educate patients, improve patient outcomes and reduce healthcare costs associated with opioid use, and has received national recognition for its Pain Management Collaborative in 2016. Learn more under MHA Keystone Center Efforts. Michigan Opioid Law FAQ Document Updated (March 6, 2019): The Michigan Department of Licensing and Regulatory Affairs (LARA) and the Michigan Department of Health and Human Services (MDHHS) released an updated version of their Frequently Asked Questions (FAQ) document to provide clarification regarding implementation of the Michigan opioid laws. LARA Revises the Pharmacy – Controlled Substances Rules (Jan. 7, 2019): LARA issued changes to the Pharmacy - Controlled Substances Rules and issued an updated version of its Michigan Opioid Laws FAQs. A summary of significant changes is available in the MHA newsroom. A full set of the rules is available on LARA’s website, along with FAQs that were updated as of March 6. Questions about these revised rules can be directed to the LARA office at (517) 241-0199 or by email to BPLHELP@michigan.gov. Information Issued on Emergency Rules for Reporting Opioid Overdoses (Oct. 26, 2018): A set of emergency rules require hospitals to report opioid overdose statistics to the MDHHS upon request. The rules are meant to inform the public health response to the substantial increase in cases of prescription and illicit drug overdoses. The MDHHS has released a set of Frequently Asked Questions (FAQs) relating to the emergency rules and the development of a permanent rule. Members with questions about the rules and/or the FAQs should contact Sarah Lyon-Callo in the Bureau of Epidemiology and Population Health at (517) 284-2910. The state is providing funding for integrating the Michigan Automated Prescription System (MAPS) with the electronic health records and pharmacy dispensation systems of hospitals, physician groups and pharmacies across the state to help combat the misuse of prescription drugs. To take advantage of the funding available for integration, the MHA urges hospitals to request software integration from LARA. The Start Talking Form is designed to satisfy patient education and parental consent regulations regarding opioid prescriptions under Public Act 246 of 2017 which became effective June 1, 2018. Download the Word template version of the form or access it under the Prescribers tab on the MDHHS's website. Public Act 248 of 2017, which became effective on June 1, 2018, requires a licensed prescriber to register for MAPS before dispensing or prescribing a controlled substance. The state has developed a mechanism to verify if a licensed prescriber has registered for MAPS. To assist in ensuring all needed information is provided to state, the state has created a CSV template as a guide. Once the list is filled out, email a copy to LARA for verification. The Michigan Opioid Legislation Hospital Compliance Checklist was created to help guide MHA-member hospitals through the requirements of a package of bills signed into law in December 2017 in response to the opioid epidemic. Disclaimer: This document does not constitute legal advice. Please note that guidance from the state of Michigan is subject to change, and organizations are encouraged to contact legal counsel for legal advice. The Prescription Drug and Opioid Abuse Commission released its prescribing recommendations for surgeons, emergency departments and dentists when treating acute pain. The Michigan State Medical Society can also be used as an opioid epidemic resource. Nonopioid Directive Form (March 28, 2019): A new state law allows patients to direct health professionals to not administer opioids to them through a new state form, the Nonopioid Directive. The form can be downloaded from the Michigan.gov website, and additional resources are available to help with opioid addiction on Michigan’s Opioid Addiction Resources website. New Medication Disposal Resources: One of the best ways individuals can fight the opioid epidemic while protecting the environment is to properly dispose of unwanted and expired medications. The resources below are ready to share with patients and more information is available on the Michigan Department of Environmental Quality website. 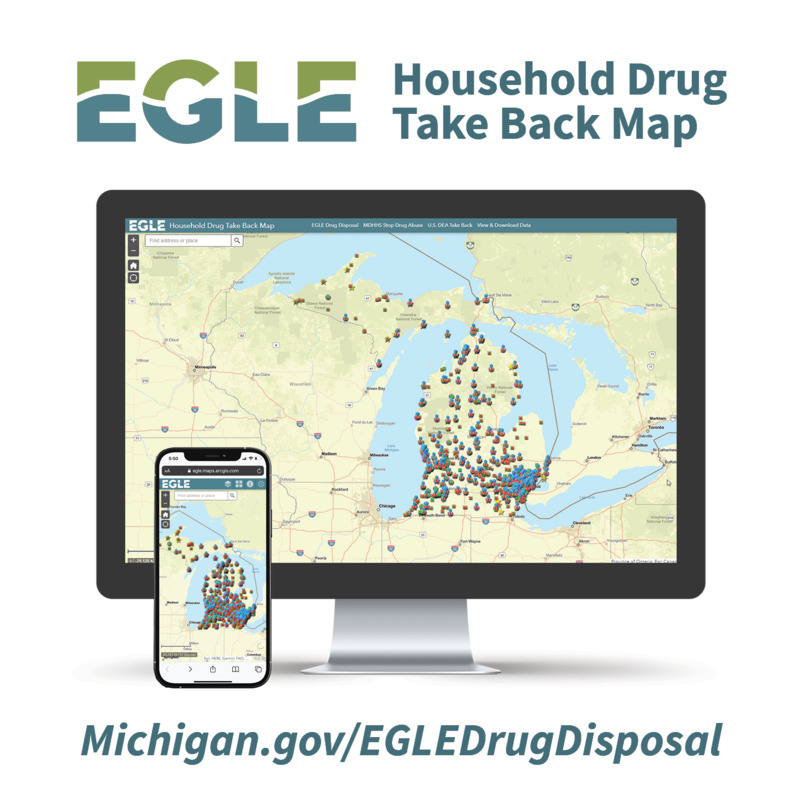 Household Drug Take Back Map. Household Drug Take Back Map Flyer. Household Drug Take Back Map Ad. MDEQ Minute YouTube Video on Drug Disposal. The MHA continues to work with elected officials on addressing the opioid issue on behalf of Michigan hospitals and patients. Click on the bill names below for the latest information on active legislation surrounding the opioid crisis in Michigan. The MHA Keystone Center, as part of the Great Lakes Partners for Patients Hospital Improvement Innovation Network, launched a multistate initiative in September 2018 to reduce the administration of opioid medications by emergency department clinicians. The Midwest Alternative to Opioids (ALTO) program will expand on the success of the ALTO program that was initially launched by the Colorado Hospital Association and reduced opioid use in 10 Colorado hospitals by 36 percent over six months. To date, 25 hospitals are involved across Michigan, Illinois and Wisconsin. This initiative builds on previous MHA Keystone Center work, including the MHA Keystone: Pain Management collaborative that launched in 2015 to address the growing concerns surrounding opioid overuse in the hospital setting, develop opioid prescribing guidelines and distribute resources for patients. The initiative aimed to improve pain management, decrease opioid use, and educate patients about safe pain management. It received national recognition for its progress toward those goals which resulted in improved patient care and reduced healthcare costs. Working with partner organizations under the MHA Keystone Hospital Engagement Network and the Great Lakes Partnership for Patients Hospital Improvement Innovation Network to decrease the use of opioids and instances in opioid-related adverse events in hospitals in Michigan, Illinois and Wisconsin. Participating in national opioid task forces by several MHA and MHA Keystone Center staff members. To learn more about the MHA Keystone Center’s work to combat the opioid epidemic, contact keystone@mha.org. Members with questions about legislative issues and clinical practices around opioids can contact the MHA. An episode of the MHA’s podcast, the MiCare Champion Cast, covered the opioid epidemic and new steps being taken to help prevent opioid abuse and overuse. The episode featured interviews with Paige Fults, director, advocacy, Michigan Health & Hospital Association; Kim Gaedeke, acting deputy director, Department of Licensing and Regulatory Affairs; and Robert Nolan, DO, director of emergency medicine, Lakeland Health.